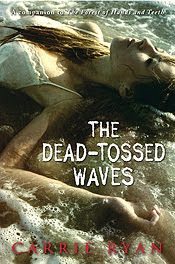 The Dead-Tossed Waves by Carrie Ryan. Delacorte Books, an imprint of Random House. 2010. Review copy supplied by publisher. Companion to The Forest of Hands and Teeth. Carrie Ryan's book tour. The Plot: Gabry has been raised behind the safe walls of Vista. She lives in a lighthouse with her mother, Mary, gazing beyond the boundaries of her town, looking out to sea, but never wanting more than the safety she has. Beyond those safe borders are the Mudo. The border walls are secure against the Mudo and their bites that infect, kill, leaving the bitten to return as one of the Mudo. One night, Gabry and a group of her friends slip over the protective wall to go to the abandoned amusement park. Whether its because the Mudo have always been so far away, or because they have never breached the wall, or because as teens they believe nothing can ever happen to them, they leave Vista for a few hours one night. The Good: Do I really have to tell you that it does not end well? And this is only the first few chapters. It just gets worse from there... (or, actually, better, because this book is awesome and it is one of my favorite books of 2010, see sidebar). And do I really have to tell you the Mudo are zombies? But, like Ryan's first book which told a teenage Mary's story (The Forest of Hands and Teeth), the "z" word is never mentioned. I wonder if, in a world where the unthinkable happened -- zombies are real -- to use that word would just be unbearable. Gabry joins her friends in the ill-fated forbidden trip to the amusement park because of her crush on Catcher, her best friend Cira's older brother. This one action causes unforeseen consequences (and because they are unforeseen I don't want to give too much away here!). Those consequences include meeting Elias, a stranger who becomes a friend; Gabry fleeing into the Forest; and a love triangle between Gabry, Elias, and Catcher. Zombies are fun because it can be such a great metaphor when done well. As in The Forest of Hands and Teeth, they reflect fear, of choices and life. Zombies are also the greater world; sometimes scary, sometimes threatening, but they should never be an obstacle to friendship, to family, to love, to happiness. I love that this is not a straight sequel to The Forest of Hands and Teeth. They are set in the same world, yes, but the story lines and character arcs are independent of each other. While The Forest of Hands and Teeth showed the zombie world from an isolated village, The Dead-Tossed Waves reveals a greater world, with remnants of government, of trade, of organized fighting forces and different religious reactions to the walking dead. Glad you loved it! I really enjoyed Hands and Teeth and was hoping the sequel would be great. I'm also happy it's not a direct sequel. This sounds very interesting-your review certainly makes me want to read it! Best books of 2010 is a big statement! sounds good. i'm definitely adding this to my reading batch. I'm a big fan of books that aren't straight sequels. Sometimes it's nicer to explore the same world, without the same characters. I agree with you on all points, including that this will likely be one of my favorite books read this year. I thought it better than Forest of Hands and Teeth. Gld you enjoyed it as well.